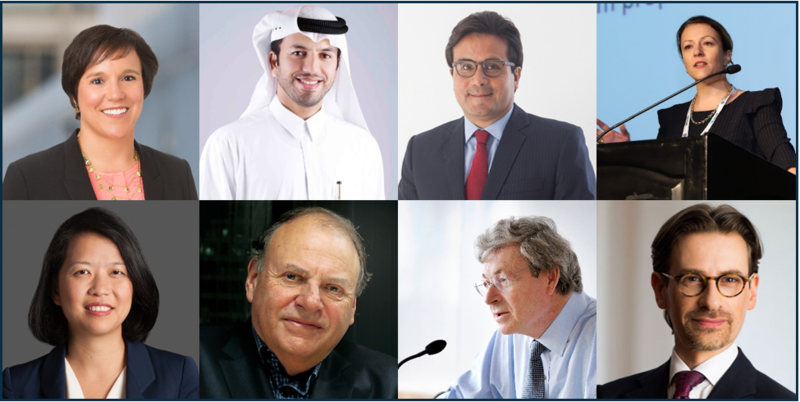 Delos is pleased to introduce its Board of Advisors, composed of global leaders in the field of international arbitration and dispute resolution. Geographically diverse, pragmatic and user-focused, they advise Delos on the full range of its activities, endeavours and initiatives, and further support the institution through shared values of excellence, integrity and independence. In this manner, they also act as an ethics committee, with whom we validate our Rules and key processes. Starting in the top left-hand corner in the above picture and going clockwise, Delos's Advisors are as follows. You can find out more about each one by clicking on their name. Ank Santens is partner at White & Case, based in New York. She has been named a Thought Leader (Who’s Who Legal 2018) among many distinctions, and serves as counsel and arbitrator in commercial, investment and construction arbitrations around the world. She is a Vice Chair of the International Bar Association's (IBA) Arbitration Committee. Dr Hassan Arab is the deputy managing partner and Co-Head of Litigation at Al Tamimi & Company, based in Dubai. He serves as arbitrator and counsel, and has also provided expert opinions on UAE law before arbitral tribunals and foreign courts. He has authored numerous publications on arbitration and dispute resolution. Jose Daniel Amado is the senior founding partner at Miranda & Amado, based in Lima. He serves as arbitrator and counsel, advises both on arbitration and corporate matters, and has taught arbitration for the past two decades. He was previously the Deputy to the Prime Minister of Peru and Chief of Advisors to the Council of Ministers. Professor Maxi Scherer is Special Counsel at WilmerHale, based in London. She regularly sits as arbitrator, holds the Chair for International Arbitration, Dispute Resolution and Energy Law at Queen Mary, University of London, and acts as the General Editor of the Kluwer Journal of International Arbitration. In addition, Prof. Scherer chairs the Delos Guide to Arbitration Places (GAP). May Tai is the managing partner of Herbert Smith Freehills' Greater China offices, based in Hong Kong. She specialises in cross-border China-related and regional Asian arbitrations, and serves as counsel and arbitrator, in commercial, construction and investment disputes. She is also a CEDR accredited mediator. Neil Kaplan CBE QC SBS has been a full-time practising arbitrator since 1995, based in Hong Kong. He has served as a Judge of the Supreme Court of Hong Kong in charge of the Arbitration List, was Chair of the Hong Kong International Arbitration Centre (HKIAC) for 13 years and President of the Chartered Institute of Arbitrators (CIArb) in 1999/2000. Professor Pierre Mayer is a Founding Advisor of Delos, and has accompanied the institution since its inception. He is an independent arbitrator and counsel, based in Paris. Previously a partner at Dechert, he has also served as President of many prestigious arbitration committees, in France and internationally. He taught arbitration, international law and contract law for close to 30 years at the University Paris-I Panthéon Sorbonne. Toby Landau QC is a barrister and arbitrator, based at Essex Court Chambers in London and Essex Court Duxton in Singapore. A draftsman of several arbitration laws, he has been involved in many of the major international commercial and investor-State arbitrations, as well as many ground-breaking arbitration cases in the courts of England, Singapore, Pakistan and the Caribbean. Delos takes this opportunity to acknowledge the generous support of the late Professor David D Caron. He was the other Founding Advisor of Delos. We held him in the highest esteem and are grateful for all of the advice he gave us over the years. The above news was covered by the Global Arbitration Review (GAR), in its article of 4 October 2018 entitled Delos unveils board.